Pork and apples go well together, I’ve known that ever since I was a kid. 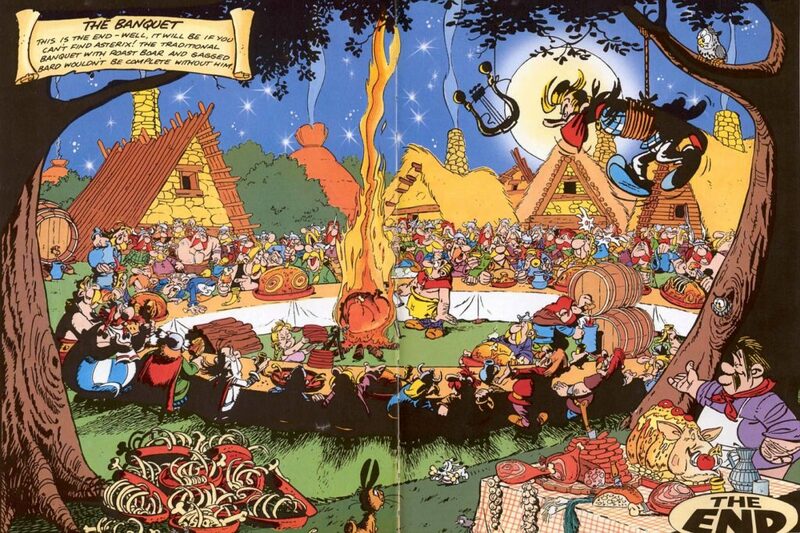 I learned it from from the French comic “Asterix”, that I was an avid reader of in my younger years. I still remember reading it in bed at night, the very last page was always a feast, usually celebrating the Gauls defeating the Romans. Even if it was just an artists rendering, the food and especially the grease dripping roast boar would make my mouth water, and it would often prompt me to get out of bed and get a snack. 20 years later I still use that knowledge I learned on the last page of an old comic, Pork and apples go well together. I try to do other variations of it, often lighter, and with more acidic or spicy elements to cut through all the fat. 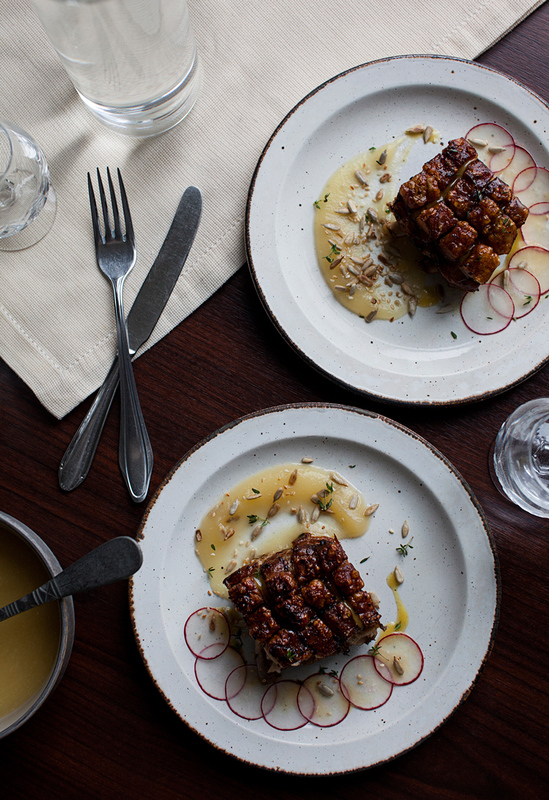 In this recipe, I will be pairing a pretty traditionally prepared pork belly with apple puree, honey mustard vinaigrette, radishes and roasted seeds. Step 1 At least 12 hours before the pork is going into the oven, cut the skin into small squares and rub with a good amount of salt, and place in fridge. Step 2 Heat the oven to 180°C. 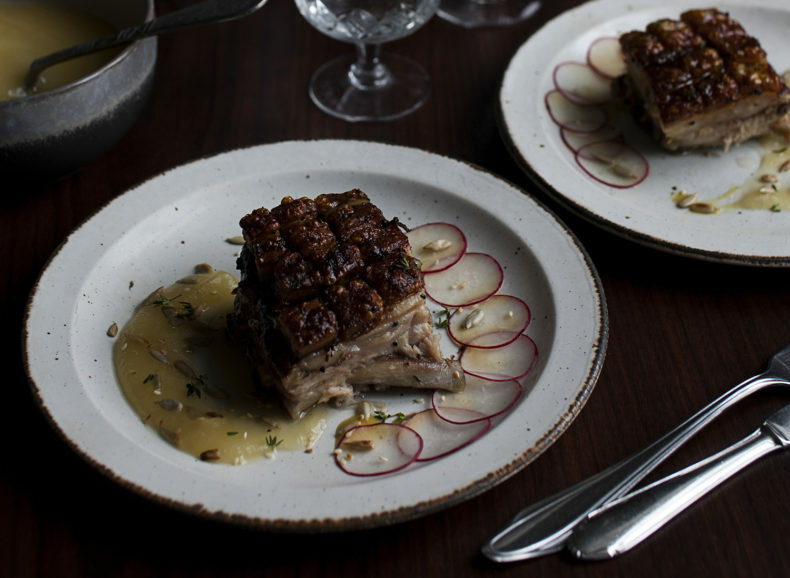 Pour the water into a casserole big enough to hold the pork belly. Throw in five of the garlic cloves. whole. 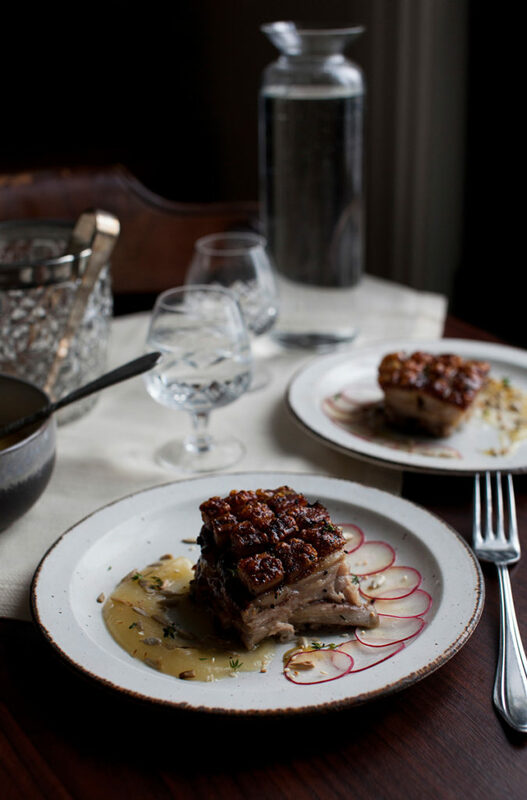 Rub the whole piece of pork belly in fresh ground pepper.Put a small plate or a shriveled up piece of aluminum foil in the middle of the casserole, and place the pork belly on top, skin side down and cover with aluminum foil. Leave for an hour. Step 3 After an hour, take off the foil and turn the rib, skin side up. Step 4 Wait for another hour, and with about 30 minutes to go, take a spoon and start basting the pork every 5 minutes or so. Remove from oven when the crackling is puffed and crispy. Step 5 For the apple puree, peel and chop the apples. Put in a saucepan with the lime juice and sugar and cook until tender. Then blend with a blender. Step 6 For the honey mustard vinaigrette, rub a bowl with a clove of garlic that’s been cut in half. Whisk mustard, honey, and vinegar first. Then add the oil, little by little, I used a little under a cup. Season with salt & pepper. Step 7 Toast a handful of seeds in a hot an dry frying pan for a minute or two, until lightly browned. Cut the radishes into thin slices, using a mandolin works well here. Step 8 Put all the elements on a plate, and sprinkle over some fresh thyme leaves. My take on Fårikål, lamb with cabbage. Nordic Provisions is a blog about food and food culture in the Nordics. We showcase recipes and produce from our beautiful region. The blog is run by Daniel, who works as a chef in Oslo, and Sofie, who is a food photographer.